Ultimate unspecific respect for what the story might be. We were having such a lovely time, sitting outside at a corner table, being treated to dinner by my niece for the very first time. A great dinner and good conversation with her and her boyfriend and her boyfriend’s mom, who was in from out of town, and everything was just winding down. I thought, “I don’t really have to, I’ll wait til I get home.” Then I thought, “It’s going to be such a pretty walk home, I don’t want to suddenly have to.” So off I zipped to the women’s room. Stuck in my stall with all my squeamishness, I remembered being in grad school and watching a documentary some guy had made of his wife giving birth. After the film, we had a class discussion about whether the guy had violated his wife’s right to privacy. In my opinion, it was my privacy that had been invaded. I didn’t want those images in my head. I’ve sometimes wondered if seeing that film contributed to my decision not to have children. That and over-population, lack of desire to semi-replicate myself, and other personal reasons. But also fear. Maybe for some people, seeing it step-by-step demystifies it in some respect so you can begin to understand the greater miraculousness of the whole process, but for me, I’m braver when I don’t know what’s going on. “Okay, but Mommy?” Oh, please don’t say anymore. I left my stall and walked to the sink as Mommy and daughter 1 walked out. I turned on the water and tried to wash my hands in a brisk, reassuring fashion, in case daughter 2 was listening and worrying about being left alone with a stranger. “Who are you?” she asked from her stall. “Oh, I’m just another customer, here having dinner,” I said. “Thank you,” I said, trying not to think about what the spot might be. I dried my hands and she closed herself back in the stall. “Do you want me to wait here ’til your mom gets back?” Please say no, I thought. I don’t know how to talk to you. “Okay, ‘bye.” I left and went back to my table. On the way, I saw Mommy getting daughter 1 settled at the table. For some reason she was carrying another chair to the table, though it looked like they were finished eating. A man and another daughter were also sitting at the table. Mommy looked very tired. I realized it must take a lot of effort to take three small children out for dinner. I don’t want to see that much reality when I’m out for a nice dinner, but it’s their reality and they’re trying to be out for a nice dinner, too. On our walk home, I didn’t mention the little girl and the mysterious spot, but I did appreciate my new Birkenstocks that no one else had complimented up until tonight. Probably because they look exactly like my old Birkenstocks, or maybe because who compliments Birkenstocks? The moon was out and the streets were quiet, and the walk was just as lovely as I’d hoped. 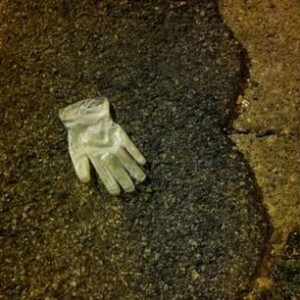 I did make Dave stop once, to take a picture of a disposable rubber glove lying in an alley just off Western. It caught my attention, but I didn’t want to get too close.